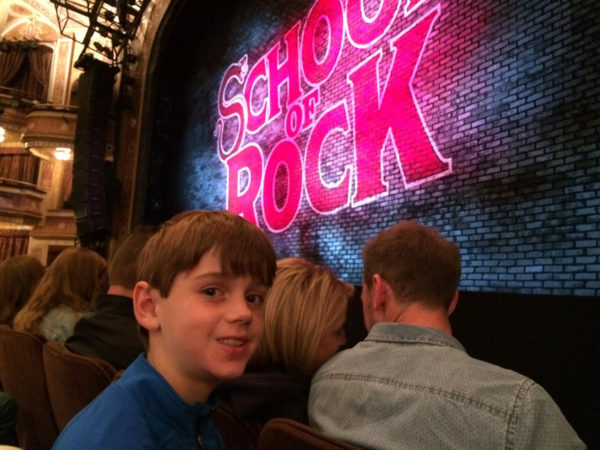 We took our kids to see their first Broadway show while visiting New York City and were totally blown away both by the show and by the quality of the seat we scored using SPG Rewards Starpoints! Our seats were in the second row! Get weekly tips & posts on how to travel nearly free direct to your inbox! Success! Now check your email to confirm your subscription. Don't forget to check your spam! Free travel could be stake :). Starwood Preferred Guest, or SPG, is the rewards program for Starwood Hotels, which owns Le Meridien (a great hotel collection! ), Aloft, W Hotels, Element, Westin and Sheraton. I love that they offer keyless entry for SPG Rewards members along with free WiFi. I applied, and was approved, for the Starwood Preferred Guest® Credit Cards from American Express — both a personal card and business card — when they had their highest bonus point offer ever of 30,000 points per card after the minimum spend (Note: The 30,000-point welcome offer has expired and is not currently available). Note: To apply for the credit cards included in this post and to help support Go to Travel Gal at NO COST to you, please click on Travel Credit Cards on the main menu above. This allows me to earn a commission so that I may continue to bring you great information free and pay the blogging bills :). I sincerely appreciate you taking this step! If you sign up for both cards with their typical welcome offer of 25,000 points, you would have 50,000 points + 3000 points (minimum spend personal card) + 5000 points (minimum spend business card — it took me awhile to reach this threshold, as I typically don’t spend this much on business expenses) = 58,000 points TOTAL. Earn your points by meeting the minimum spend. It seems to take them a good seven business days to apply the points after you have met the minimum spending requirement. Once you have your points, go to SPG.com/Moments and click on Partners/Audience Rewards. Select the city of the show you want to see in the top left. Select the show and dates you are interested in. Check both Starpoints Only or Starpoints + Cash (this is if you don’t have enough Starpoints to cover the purchase, you can pay partly in cash, partly in points) and click Results. We were able to book with 38,000 points (8500 per ticket) + $192 in cash total for all four of us — less than the cost of 1 full price ticket! Click on the various results to find a date that works for you and check the cost in points and points + cash. Note: There are four levels of seating and they don’t tell you exactly where the seats are, but go as high as you are able for the best seats. They provide you the best seats available in the seating level you have chosen with an email AFTER you purchase the tickets. We selected the best level of seating and we were in the SECOND ROW, though off to the side, but we could still see great! If you don’t have enough points, divide the total points you do have available to redeem by the # of tickets you need. Then, start a new search, select Points + Cash and tell it the number of points (total avail points/# of tickets) you can contribute toward each ticket. It will then tell you how much cash is required to actually purchase the ticket. When you are ready to purchase, you will have to connect your SPG Rewards number and account to the system before purchasing. 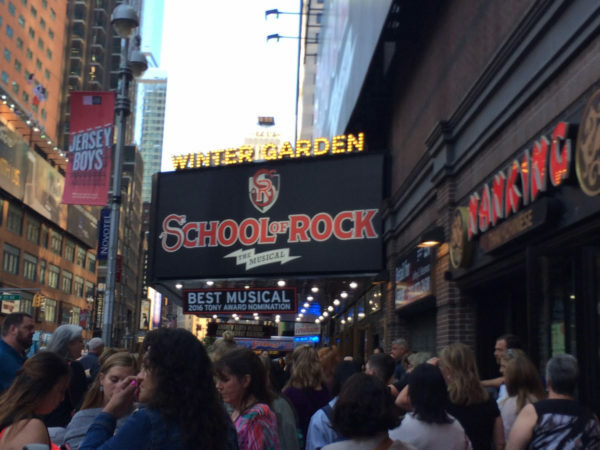 If you have kids, I highly recommend “School of Rock” on Broadway. It’s actually possible to get tickets to — unlike Hamilton 🙂 — and is incredibly entertaining from start to finish. 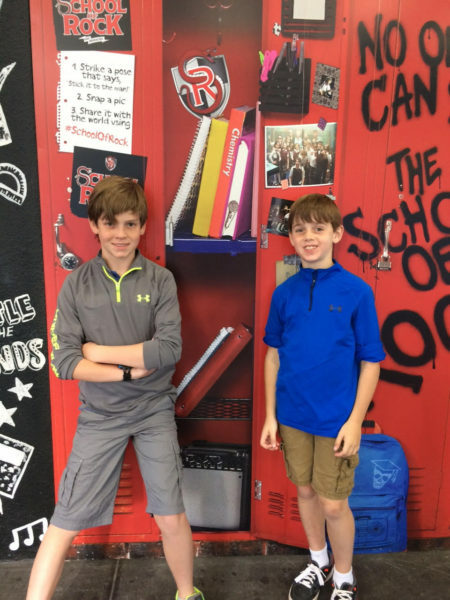 All of the kids in the show play their own instruments — electric guitar, bass guitar, drums, keyboards — and are amazing singers to boot. The lead, who plays Jack Black’s role from the movie, is fantastic. He’s about as close as you get to Jack Black without being Jack Black :). We watched the movie with our kids before coming and that really set the tone and enjoyment for the whole thing, as they knew the story and the characters. It’s definitely one of my favorite Broadway shows and was the perfect entry into live musicals for my boys! I think they’d totally be up for watching it again. What Broadway show are you dying to see? If you enjoyed this post, would you consider “liking” Go to Travel Gal on Facebook by clicking the button below?